Notice the Theses were "publicly attached" (or affixed). There's nothing at all about hammering a document to a door. One other source from a few years before Melanchthon's text actually does though mention "doors," not "a door." Georg Rorer in 1540 mentioned "on the folding-doors of the churches" in a private note (see Franz Posset, The Real Luther, p. 23). Neither Melanchthon or Rorer were in Wittenberg in 1517, so whatever the origin of this story, it certainly wasn't an eyewitness account. 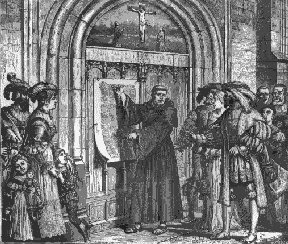 Luther himself never mentions anything about nailing the 95 Theses to the church door but rather explains how they were sent out to particular ecclesiastical authorities. The first bit of evidence is Luther's letter (or cover letter) to Albrecht from October 31, 1517 (LW 48:43) sent with a copy of the 95 Theses. 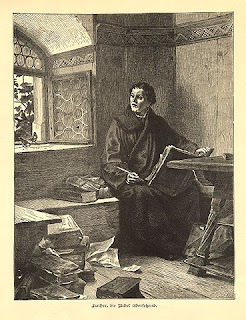 Then in a letter dated March 5, 1518 to Christopher Scheurl, he states, "... As you are surprised that I did not send them [The 95 Theses] to you, I reply that my purpose was not to publish them, but first to consult a few of my neighbors about them, that thus I might either destroy them if condemned or edit them with the approbation of others. But now that they are printed and circulated far beyond my expectation." In a letter dated May 30, 1518 to Pope Leo he states, "So I published some propositions for debate, inviting only the more learned to discuss them with me, as ought to be plain to my opponents from the preface to my Theses." In a letter dated November [21? ], 1518 to Elector Frederick,Luther states, "...[S]ome liars among ourselves falsely assert that I undertook the disputation on the Indulgences by your Grace’s advice, when the fact is, that not even my dearest friends were aware of it. "He also states that previous to the 95 Theses becoming public, he sent two letters (to the Archbishop of Magdeburg / Mainz and the Bishop of Brandenburg). 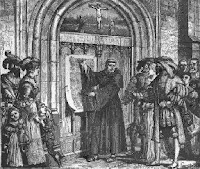 So from Luther's own accounts, he never mentions nailing the 95 Theses to the Wittenberg door. William Pauck notes,"...Luther, who had a tendency to speak freely about his career and who, in his later years, loved to reminisce, never mentioned the incident. Moreover, there are no other contemporary sources which support the old story" [Olin, John (ed.) Luther, Erasmus and the Reformation (Massachusetts: Fordham University Press, 1969, p. 52]. Yee shall knowe them by their fruits: Doe men gather grapes of thornes, or figges of thistles? covered with snow; he did have a bathroom fixation it seemd. Via the Catholic Answers forums discussion, Martin Luther's translation of the bible........., I came across a fascinating article: The Contested History of a Book: The German Bible of the Later Middle Ages and Reformation in Legend, Ideology, and Scholarship by Andrew Gow (University of Alberta). The author takes a helpful look at the significance and impact of pre-Reformation Bibles. There's a lot to chew on in this article. Overall it's probably one of the best concise contemporary overviews on this subject I've ever read in regard to pre-Reformation Bibles. [W]as [Luther] lying or just mistaken when he said this? "In his ‘Table Talk’, Luther is reported to have presented an example of the ‘extreme blindness’ under the Papacy, on the 22nd of February, 1538, namely that “Thirty years ago, no-one read the Bible, and it was unknown to all. The prophets were not spoken of and were considered impossible to understand. And when I was twenty years old, I had never seen a Bible. I thought that the Gospels or Epistles could be found only in the postills [lectionaries] for the Sunday readings... "
"Memory plays tricks, and an old man’s reminiscences about a period for the putative end of which he had come to consider himself to have been a cause might not be the best source of information for historical inquiry." And then later in the same article in regard to Luther's claim of the unavailability of the Bible ( and the related infamous Bible kept "under the bench" comment): "Both contemporary Catholic polemicists as well as those of the nineteenth and early twentieth centuries tried hard to show that Luther was exaggerating or lying." Here we see one of Rome's unwritten traditions alive and well: Luther was a liar. "Luther’s translation was read (as the source of all wisdom, no less) by tailors and shoemakers, even women and simpletons, many of whom carried it around and learned it by heart, and eventually became bold enough to dispute with priests, monks, even masters and doctors of Holy Scripture about faith and the gospels." Medieval prelates’ fears had come true, Cochlaeus is informing us. He tells the story in this form not necessarily because these were the only people reading the Luther Bible, but because they were precisely the unqualified readers of Scripture the medieval church had sought to discourage or exclude. This is actually one of the most significant comments from the article that the Catholic Answers folks should dwell on. Here the issue of authority comes front and center. One can quibble about which Bibles came before Luther, how important they were, how accurate they were, how expensive they were, who could read them, etc. These sorts of tedious Internet discussions go on endlessly as people cut-and-paste facts off the internet intending to prove their position owns history. Luke tells us the Bereans "were of more noble character than the Thessalonians, for they received the message with great eagerness and examined the Scriptures every day to see if what Paul said was true" (Acts 17:11). This is exactly what "tailors and shoemakers, even women and simpletons" were doing with Rome's Biblical interpretation and ultimate authority claims. Rome's medieval defenders like Cochlaeus would have it the other way around: the Bereans first had to be authorized by Paul to hear his message and then authorized to read the Bible to see if what Paul said was true. That is, the authority is assumed before it's proved. The current generation of Rome's cyber-defenders (like those on Catholic Answers) ultimately want people to accept the absolute authority of their infallible magisterium, and that they are the ones qualified to interpret the Bible and that those not accepting this authority are not qualified. There's not much of a difference in intent between the complaint of Cochlaeus and Rome's modern cyber-warriors. The world at this time needs this kind of discussion and debate. We can disagree without resorting to sinful anger, ad hominem arguments, insults or violence. Dr. White did an excellent job; and the Imam was very respectful and showed better knowledge of the issues than most Muslims. He had to be corrected on the common mistake that Muslims repeat that "The Council of Nicea and Constantine decided which books belong in the canon". 1. Liberal scholarship constantly attacks the dates of the NT books and distorts the canon process. 2. The claims of the Roman Catholic Church put the Church over the canon, and that needs to be challenged also. Dr. White gave the Imam 2 books on the canon by Dr. Michael J. Kruger. Tetzel: "For every mortal sin a man commits he must, after making a good confession, suffer seven years in purgatory, unless he has done seven years penance"
Yes, I can help. The quote appears to be a condensed version of this extract from a Tetzel sermon. Note the similarities below (placed in bold type). See also my blog entry here. You may obtain letters of safe conduct from the vicar of our Lord Jesus Christ, by means of which you are able to liberate your soul from the hands of the enemy, and convey it by means of contrition and confession, safe and secure from all pains of Purgatory, into the happy kingdom. For know, that in these letters are stamped and engraven all the merits of Christ's passion there laid bare. Consider, that for each and every mortal sin it is necessary to undergo seven years of penitence after confession and contrition, either in this life or in Purgatory. How many mortal sins are committed in a day, how many in a week, how many in a month, how many in a year, how many in the whole extent of life! They are well-nigh numberless, and those that commit them must needs suffer endless punishment in the burning pains of Purgatory. But with these confessional letters you will be able at any time in life to obtain full indulgence for all penalties imposed upon you, in all cases except the four reserved to the Apostolic See. Thence throughout your whole life, whenever you wish to make confession, you may receive the same remission, except in cases reserved to the Pope, and afterwards, at the hour of death, a full indulgence as to all penalties and sins, and your share of all spiritual blessings that exist in the church militant and all its members. Do you not know that when it is necessary for anyone to go to Rome, or undertake any other dangerous journey, he takes his money to a broker and gives a certain per cent—five or six or ten—in order that at Rome or elsewhere he may receive again his funds intact, by means of the letters of this same broker? Are you not willing, then, for the fourth part of a florin, to obtain these letters, by virtue ofwhich you may bring, not your money, but your divine and immortal soul, safe and sound into the land of Paradise? I'm fairly confident that the quote you sent me is from the very context of this sermon selection. I've worked through many of these sorts of things before. The language of the quote is very similar to that sermon. Keep in mind that there is not a lot of Tetzel available in English, so I would be greatly surprised if the quote you sent me is from something different than the sermon snippet posted above. The source of the sermon is cited as, "From the Latin. Gieseler: Ecclesiastical History, Vol. V., pp. 225-26." This source can be found here. There you will find the Latin version of part of Tetzel's sermon. The author also notes, "Tetzel also issued an Instructio summaria for the parochial clergy, in what they were to go to work in behalf of the indulgence..." This is probably the "letter" you're referring to. The source goes back at least one more step to Herr D. Löscher, Reformationsacten, whom I think, published in the 18th century. I do not have access to that. It may be online somewhere, I don't know. 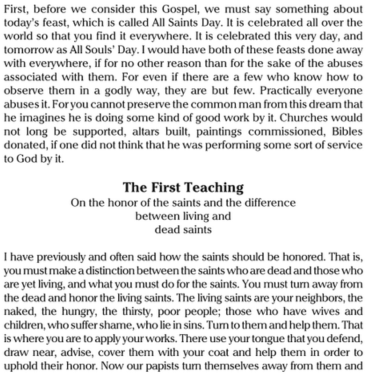 Here's a snippet from The Festival Sermons of Martin Luther on the best way to honor the saints. The entire sermon is an interesting read. 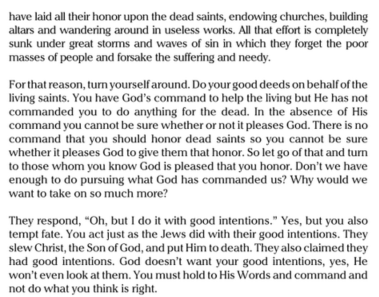 Luther goes on to describe the proper way to honor departed saints, as well as offering a few tips on how or if one should pray for the dead (he makes similar comments in the treatise, Confession Concerning Christ's Supper, see my discussion here about prayers for the dead).